Putin wants a shining legacy. He has to solve 3 big problems first. The following was originally posted to The Monkey Cage. Philipp Casula (@PhilippCasula) is a postdoctoral researcher at the history department of the University of Zurich and a fellow of the Swiss National Science Foundation and researches the dynamics of Russian relations with the Middle East. Camille-Renaud Merlen (@crmerlen) is a PhD candidate and assistant lecturer in international relations at the University of Kent. He researches Russian conceptions of sovereignty and Moscow’s engagement with supranational courts. While U.S.-Russian relations continue to sour in a standoff over Syria, Russian President Vladimir Putin has just started his new term in office and is mulling how to secure his legacy. In his fourth and likely last term, he will be working on establishing himself as the leader who returned Russia to international grandeur, stabilized the economy and increased the urban standard of living. But while Putin’s assertive foreign policy has been popular at home, it has also embroiled Russia in complex predicaments that may undo that popularity. Let’s look at the key international challenges that will help define how Russia will remember Putin. After the Cold War, Russia was too weak to form any genuine partnership, leaving the United States as the world’s sole military superpower. When Putin came to power in 1999, he promised he would improve relations with the West while increasing Russia’s international standing. Despite some periods of cooperation, U.S.-Russian relations have soured. Putin has spent a decade denouncing U.S. unipolarity. Under his leadership, Russia’s military has intervened abroad, with “troll factories” allegedly interfering in other nations’ elections. Putin’s efforts to reestablish Russia as a great power have helped his popularity soar. However, it’s hard to see how Russia will repair its relationship with the United States, if indeed that’s what Putin wants, given allegations of Russian interference in the 2016 U.S. presidential election, U.S. retaliation for Russia’s alleged chemical attack against a Russian ex-double agent on British soil, and most recently, President Trump’s attacks on Putin for backing President Bashar al-Assad’s alleged use of chemical weapons in Syria. Russia now seems locked in a costly and lengthy confrontation with the United States and its allies — what some observers are calling a new Cold War. To establish a positive legacy, Putin likely needs U.S. recognition and the end of sanctions to help the Russian economy thrive. In 2014, Russia annexed Crimea and backed separatists in eastern Ukraine, sending in the military and upsetting Kiev’s control of the region. Those events have since dominated Russia’s relationship with European Union nations. The swift and surprising action in Crimea has been good for Putin’s popularity at home. He has enjoyed a wave of “Krym nash” (“Crimea is ours”) nationalism, with 84 percent of Russians recently supporting Crimea’s “return” to Russia. He also sent a clear message to the West that the post-Soviet region, Ukraine in particular, is a “sphere of interest” for Russia and off-limits for NATO and the E.U. This approach has strained relations with Europe, and with Ukraine itself. Further, the Kremlin is now responsible for proving to Crimeans, Russians and Ukrainians that Crimea is better off as a part of Russia than with Kiev. Doing so may require hefty investments at a time when other regions, like the northern Caucasus, also need federal subsidies — while Russia faces Western sanctions and its economy is growing only modestly. Clearly, most Russians will see acquiring Crimea as one of Putin’s defining legacies. But if that means the loss of meaningful ties with Ukraine and the E.U. and an economic burden, they may decide that the price was too high. Meanwhile, Europe is angry that eastern Ukraine is embroiled in ongoing conflict, with daily skirmishes between Ukrainian government forces and Russian-backed separatists. Russian intervention succeeded in preventing Ukraine from associating itself with the E.U. as an intact country. Further, Russia is losing influence in Ukraine. On April 12, Kiev announced that it would leave the Commonwealth of Independent States, the organization that unites most former Soviet republics. That’s a problem for Russia. Ukraine is one of its important trading partners, a transit region for energy deliveries to the West, and one of its culturally closest neighbors. Failed states such as the two separatist republics in Ukraine are sorry trading partners and are likely to be political and economic burdens — both for Kiev and Moscow. 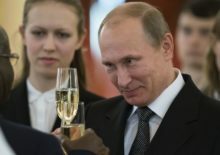 As relations with the West have disintegrated, Russia has improved ties with other parts of the world, which some call Russia’s “pivot to the East.” Most notable is that it has dramatically reshaped its position in the Middle East — particularly in Syria, where it has insistently backed the regime of Assad against rebels inspired at first by the Arab Spring. In doing so, Putin built on traditional Russian ties and Soviet approaches to the Middle East. As we have shown elsewhere, Russia’s diplomats put much effort into bringing Syrian conflicting parties together and convincing the Gulf states to end or limit support for certain rebel factions, especially the Islamic State. Russia may be the sole power on good terms not just with Damascus and its allies, but with most powers in the region, including the Kurds, Turkey, Hezbollah and Israel. Nevertheless, these efforts crumbled in late summer 2015. With the Syrian regime on the brink of collapse and no diplomatic solution in sight, Russia dispatched its air force and later ground troops. This military effort reversed much of the Syrian government’s territorial losses. This has been post-Soviet Russia’s first military intervention outside the former Soviet Union — and it is about more than saving a client regime. Putin’s goal is to restore Russia as a global player and as a force to be reckoned with in any conflict-resolution scenario in the Middle East. That goal matters more than tactical successes such as securing long-term contracts to use Syria’s Hmeimim Air Base. As a result, Russian involvement in the Syrian conflict could be one of Putin’s major international achievements — but only if the intervention does not turn out to be too costly in economic and diplomatic terms, and if the Syrian regime is stabilized enough to carry on for the foreseeable future. While the Assad regime is consolidating its gains, the situation remains highly volatile, as the recent use of chemical agents on Syrian soil shows. And it’s not Moscow but Tehran calling the shots in Damascus. It’s hard to see how Putin will untangle these knotty conflicts, all of which could undermine his domestic reputation.